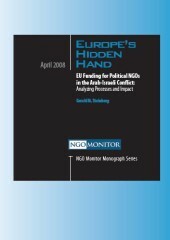 The European Union (EU) provides substantial funding to highly politicized NGOs active in the Arab-Israeli conflict through various funding mechanisms. Due to the highly complex and poorly coordinated nature of EU aid and to the lack of a consolidated database differentiating between NGOs and other types of organizations, it is impossible to determine the exact amount or proportions of EU funding to civil society organizations. EU Funding for NGOs- Value for Money?